“We urge those who have turned to violence for political ends to stop” – Desmond Tutu As Egypt prepares for the second phase of its constitutional referendum amid reports of violence between rival political blocs, The Elders urge the people of Egypt to address their divisions peacefully and protect the country’s democratic transition. The Elders appeal for calm in Egypt in the lead-up to a second day of voting in a referendum on the country's new constitution, due to take place this weekend. They stress that free expression should be encouraged and embraced – but only through peaceful means, amid worrying reports of violence between political groups in parts of the country. The Elders are concerned that the escalating polarisation of Egyptian society may threaten the country's progress towards full democracy. During a visit to Cairo in October 2012, three members of The Elders, Gro Harlem Brundtland, Jimmy Carter and Mary Robinson, met leading national figures and members of civil society, including young Egyptians, to lend support to the country's inclusive democratic transition. The Elders were encouraged by their enthusiasm and desire to participate in the country's political future, after decades of authoritarian rule. At this landmark moment for Egypt's emerging democracy, The Elders call on leaders of the rival political blocs, as well as all those who feel marginalised by recent political events, to participate in constructive dialogue, in the larger interests of Egypt as a whole. “To those in Egypt who have turned to violence for political ends: we urge you to stop. Too many lives have been lost already. The referendum on the new constitution is being held on successive Saturdays: Cairo, Alexandria and eight other governorates voted on 15 December; the rest of the country will be able to cast its vote on 22 December. Since the beginning of the wave of popular uprisings that swept the Middle East and North Africa two years ago, The Elders have stood with all those across the region who have taken their destiny into their own hands to demand dignity, freedom and human rights. The Elders support these legitimate demands and join the call for an end to authoritarian rule, oppression and corruption. The Arab Awakening ignited an interest in governance across all sectors of society, which should be embraced and encouraged. All members of society – including young people, women and minorities – must have the opportunity to participate fully in building the institutions of government. It is also essential for new constitutions to enshrine universal rights and freedoms. 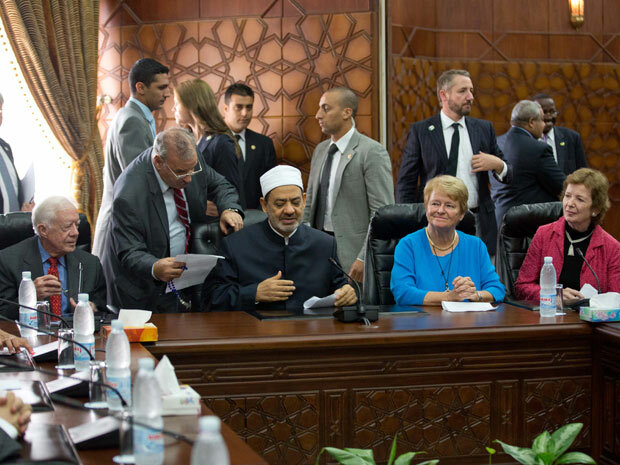 In October 2012, former Prime Minister of Norway Gro Harlem Brundtland, former US President Jimmy Carter and former President of Ireland Mary Robinson visited Egypt to support an inclusive democratic transition in the country.